*Registering for more than 1 car? so bring something to eat and drink! HELMET FOR EACH DRIVER AND PASSENGER. with you on the day of the event! any repairs or mishaps from the day, music, and BBQ. if you are interested in volunteering. on display for everyone else to admire!" and the 20th anniversary of the 850. I put out a call for judges and volunteers for Davis earlier today. The Chapter's are trying hard to make this the event of the year, but in order to do so we need volunteers. 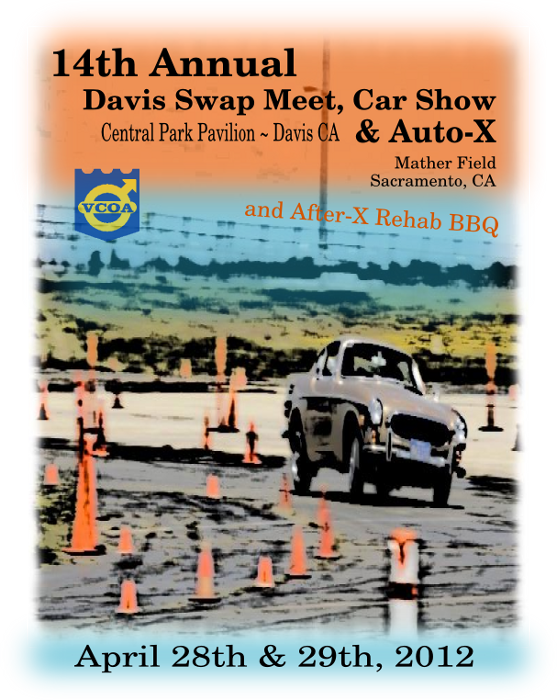 If you are coming and can offer a bit of time either for the Auto-X or the Car Show and Swap Meet on Sunday we need to hear from you. The more bodies we have the less each of us have to work. Think of it as a Habitat for Humanity Volvo style. We want to break some records this year. The record attendance at Davis is about 125 (126 IIRC) cars. Sell out is appx 150 cars. Bring em out and lets have to close the gate to entries. Several sponsors have already committed with lots in store. We also have a Volvo North America Regional Market Manager interested in getting involved, but we need to show him that we can put together a event worthy of their participation. In order to do this we need Volvo owners to come out in force! The front features the Golden Gate VCOA logo. The back features Sacramento VCOA's S. Ream's 1966 P1800S at the 2011 Autocross. an 1800 at an autocross. And, at the day of the event. Supply is limited, so order early! The 14th Annual Northern California Volvo Weekend got underway on Saturday, April 28, 2012—a warm, clear, sunny day—with the Sacramento Chapter sponsoring the 3rd Annual Autocross at a new larger location on the old Mather Air Force Base in Rancho Cordova, CA, just east of Sacramento. Mather Airport made the new larger space available to us to test its use for autocross events. We found the area to be perfect for autocross as the area consists of smooth concrete, has no elevation changes, is clean, and has over 100,000 square feet of open space. The space has been secured for future events and provides ample room for future growth! The larger space afforded a larger course that allowed for bursts of speed as well as tight turns that challenged the driver’s skill and moxie, equalizing the advantage between the rear wheel drive and front wheel drive cars. Competitors ranged from novice to expert and competed in Volvos ranging from an 1800 to a C30. Twenty five drivers competed in two groups and were allowed four runs of one lap each to achieve the best time of the day. A black modified 242 with multiple drivers took first and second place. Ryan Randall took top honors this year with his clean run of 42:84 seconds, while David Cain finished second with his clean run of 44:36 seconds. Rounding out the leaderboard in a black V50 was Kyle Eisenbach with his clean run of 44:81 seconds. After all the Volvos had finished their runs, non-Volvos were allowed to run the course for a $5 per lap donation to charity. Participants also included Volvo competitors looking to improve their times or drive another competitor’s car. From the beginning, the Autocross has been organized as a charity event, and this year’s event proceeds benefited the Leukemia and Lymphoma Society (http://www.lls.org/) on behalf of Delbert Stapp’s “Man of the Year” fundraising competition for the charity (http://www.mwoy.org/sac/ | web archive). Following the Autocross awards ceremony, Sacramento Chapter President Mark Baldwin hosted the 2nd Annual Autocross Rehab Party at his beautiful facility just a few miles away from the Autocross. This year’s Rehab party included a car wash area, available rack/equipment to assist with any repairs or mishaps from the day, music, catered BBQ dinner, a Disney Pixar “Cars” themed cake, and a car smash charity fundraiser that also benefited the Leukemia and Lymphoma Society. The great weather continued on Sunday, April 29, when the Golden Gate and Sacramento Chapters co-sponsored the 14th Annual Davis Car Show and Swap Meet, drawing 114 registered cars and two hundred Volvo enthusiasts from all along the west coast, Nevada, and one from Missouri, to the City of Davis, 15 miles west of Sacramento / 75 miles northeast of San Francisco. As an added bonus, Davis Central Park was double booked with the Davis Flea Market and Music on the Green increasing the cross-pollination of the Davis, student, and Volvo communities. While the event has continued to grow over the years, the small town charm remains as old friends and new acquaintances gather to unveil restoration/modification progress, share part resources, and discuss everything Volvo. Whatever your Volvo needs, you are likely to find someone with the answer at the Davis car show and swap meet. Volvo P1800 and 850 were featured cars to celebrate their 50th and 20th Anniversaries, respectively. Volvos from 1956 to today were represented, including Lars Jansson’s rare P1900, Bruce Ackerman’s race proven 1800, Mike Dudek’s Masters Class winning low-mileage 1800ES (originally owned by Allen Funt of Candid Camera fame), and ipd’s tricked-out XC60R Design Project. Other highlights included a large swap area with Volvo parts and collectables as well as sponsor/vendor booths from Ackerman’s Servicing Volvos, Inc., ipd, RSI, and Turner Volvo to see the latest offerings and directly interact with these enthusiast-friendly companies. There were two special awards: The Golden Rod Award to recognize an individual that has consistently shown improvement in caring for and presenting his car at the Davis Show and the GGVCOA Heritage Award to recognize an individual who has represented, along with his car, the best of the Volvo brand tradition over the history of the Davis Show. Thank you to the numerous sponsors and volunteers who helped staff and support the autocross and car show as well as to everyone who attended this year’s event and made it such a great weekend. 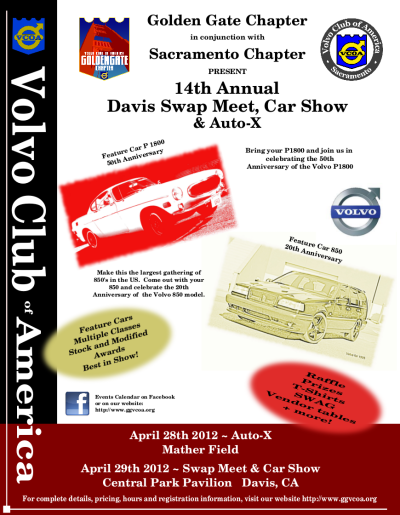 Save the date: Next year’s Autocross will be on Saturday, April 27th and the Davis Car Show and Swap Meet will be on Sunday, April 28, 2013. 2012 (Sacramento) Davis Autocross Group. Photo by Tony Bird. Click on photo to see larger view in new tab/window. Link to Tony Bird's entire event photo album can be found below. Engine Blow at Autocross Rehab Party. Car donated for Charity Car Smash. 2012 Autocross videos are being processed/uploaded to YouTube. The spreadsheet on this webpage automatically updates with any changes (you may need to refresh the page to see the changes). Plan: Santa Cruz / San Mateo mountains drive. 1N back to Half Moon Bay. BBQ and picnic eats from 11:30, cake around 4:00." Park. Stay tuned for more details!